Two great money-saving special offers end this Tuesday, June 30th, at QSource.com. 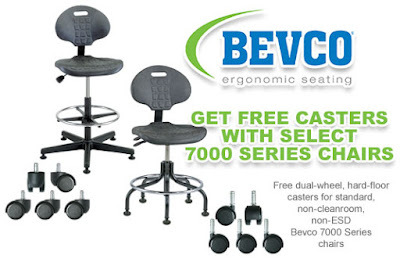 There are just a few days left to "Buy 3 EB-2000S-K Soldering Systems and Get 2 FREE" and "Get FREE Casters with Select Bevco 7000 Series Chairs." The EB-2000S-K Soldering System offers proven soldering technology that provides even and accurate tip temperature. 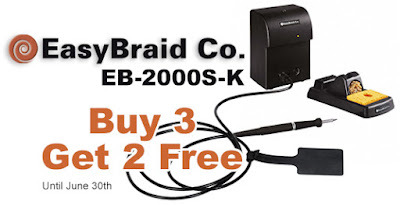 EasyBraid's EB-2000S-K includes the EB-2000PS Power Supply, SHP-K Soldering Handpiece, SHH-4 Soldering Handpiece Holder, RMP-1 Tip Removal Pad, BC-1 Brass Curls, SPG-1 Sulphide-Free Sponge, and the CC-1 Connection Cable. All you need to do to get your two FREE stations is buy them from QSource.com by June 30, 2015, complete the redemption form (available online), and send it in to EasyBraid. Bevco's 7000 Series Chairs offer a sturdy, comfortable solution for long-lasting seating. Our special promotion gives you FREE dual-wheel, hard-floor casters (non-cleanroom/non-ESD) with the purchase of standard 7000 Series Chairs. Eligible chairs (part of the 7000 and 7000D Series) are available in three colors and a number of height adjustment ranges. Don't let these amazing offers pass you by. Visit QSource.com before Tuesday, June 30, 2015, and make your purchase at either our "Easy Braid EB-2000S-K Soldering Station - Buy 3 Get 2 Free" page or our "Bevco 7000 Series Free Casters" page and get your FREE items. For additional information or questions about these special promos, you may contact us by phone (800-966-6020), email, or via our Web site.